Last time I introduced you to a long, complex game in Battlestar Galactica: The Board Game. 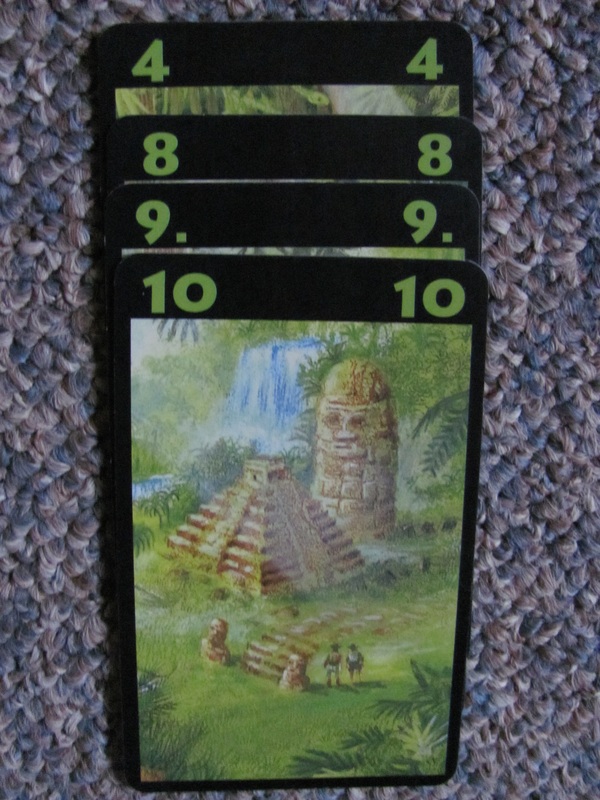 This month I want to go the opposite direction to a quick, easy-to-understand, two-player card game. You’re an archeologist setting out on expeditions to find lost cities in the Himalayas, the Brazilian rain forest, the shifting sands of the desert, within volcanos, or at the bottom of the sea. But you have limited resources. You need to invest into each expedition you begin, and if you don’t at least make back that investment, you might never recover. How Well Does the Theme Work? The game would be fine without it. Normally I’m someone who wants a strong theme in a game, but in this case, I loved the way this game played so much that I didn’t care that the theme didn’t add much to the game. It’s just a structurally sound, fun game. 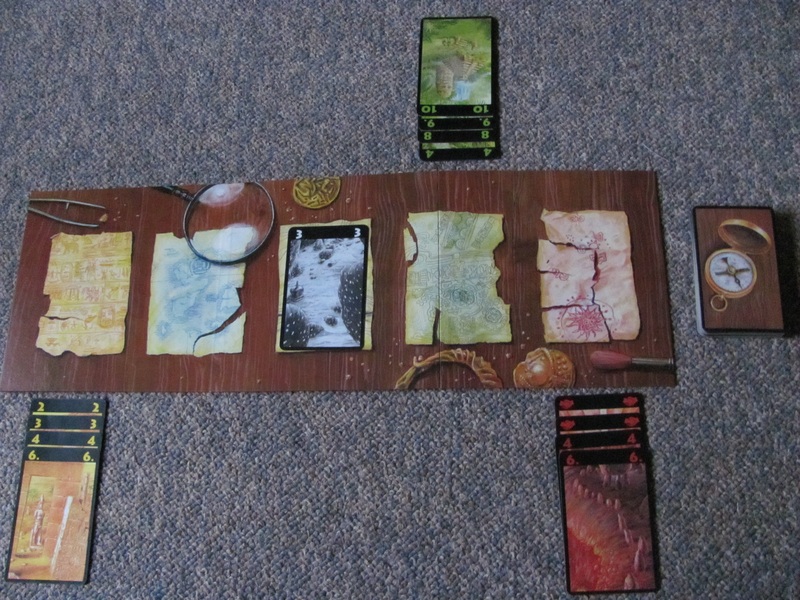 The game board is basically a spot to lay the discard piles and line up your expeditions. I wish the artwork had been prettier, but it’s not a big deal. 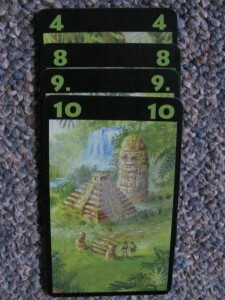 To score points, you lay down cards (organized according to color) in stacks from lowest to highest. There’s only one card of each number for each of the colors—for example, there’s only a single red three. If the other player plays the card you needed, you’re out of luck. You can skip numbers (so your stack could go 2, 3, 5, 9), but that makes it harder to earn back the 20 points you need just to make your investment on the expedition. If you don’t earn back your investment, you lose points at the end of the round. If you do make the 20 points, everything above that earns positive points at the end of the round. This is a super simple game to understand because you’re basically just drawing, playing, or discarding cards to try to make stacks of cards in ascending order, organized by color. That’s not to say there’s no strategy involved. There is. You have to either play or discard a card before you draw another card (you can only play one card per turn). On their turn, your opponent can take the top card from any of the color-coordinated discard piles. So do you play your blue 5 even though you don’t yet have the 4 or do you discard the yellow 9 you know your opponent needs (thereby giving them those points)? How long do you wait for a card to come up (because the game immediately ends when the draw pile is gone)? Which expeditions should you try for and how many? One thing I love about this game is its length. You can easily play a game in 20-40 minutes (a game is three rounds of finishing off all the cards and scoring, so you can see how quickly a single round plays). For my husband and I, when we don’t have time for a long game but we want some time together, this is our go-to game. The brevity also allows us to play multiple times, and we almost always want to keep playing. 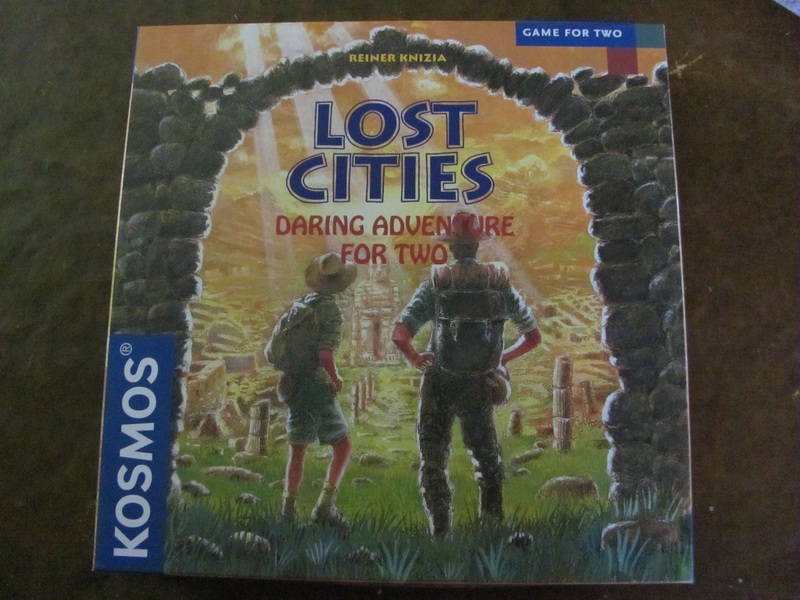 Lost Cities is part of the Kosmos line of two-player games. This makes it great for couples like my husband and I who don’t yet have kids. There is a four player variant described in the rule book, but you can’t play it unless you buy a second copy of the game. However, it’s obviously not a game the whole family is going to be able to sit down with together unless you only have a family of two. It is a game siblings could play together or a parent and one child could play together, so I wouldn’t write it off entirely if you have kids. Have you tried Lost Cities? Do you prefer a straight-forward game like this or something more complex? Click here if you’d like to check out Lost Cities .